19.04.2012. Stratford, East Lonfon, England. The London Aquatics Centre. 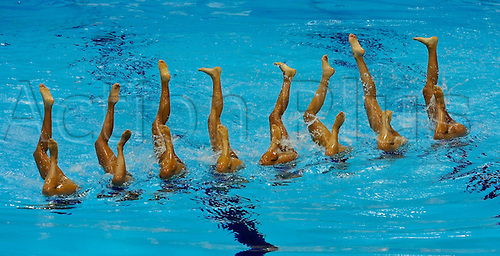 FINA Synchronised Swimming Olympic Qualification. Japan's Yumi Adachi, Aika Hakoyama, Inui Yukiko, Chisa Kobayashi, Risako Mitsuri, Mai Nakamura, Mariko Sakai, Kurumi Yoshida in action at the London Aquatics Centre during the Teams Technical routines on day two.18-22 April, 2012 London, England.